The LGM Arabic Language Learning Programme (Beginners Level) lessons aim to assist those who wish to acquire proficiency in the Arabic language for the sake of understanding the Quran. Learn Arabic language through applications and examples from the Quran with linking to the meaning of the verses. 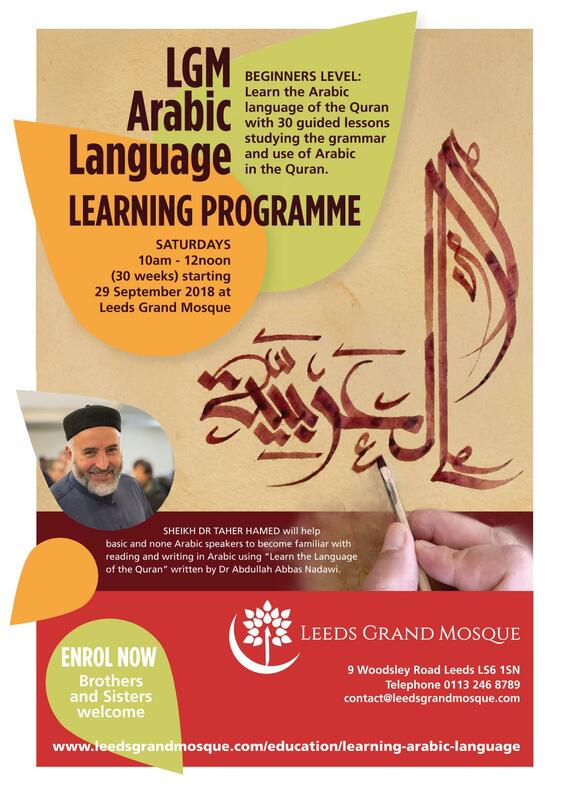 This learning programme will be presented by Sheikh Dr Taher Hamed the Imam and Khateeb of the Leeds Grand Mosque, by studying the very beneficial book: "Learn The Language of Quran" written by Dr Abdullah Abbas Nadawi. 30 weeks course starting from Saturday 29 September 2018, for those who have none or basic knowledge of the Arabic language, in preparation to embark on learning journey with LGM. Day & time: Saturdays from 10am till 12pm. Fees: £150 for the Academic year wich will include the study materials and possible part refund for the successful ones!